Gourmet Gob: Cathy Crawford's version of Helena Lyttle's - Cheesy Potato Pie! 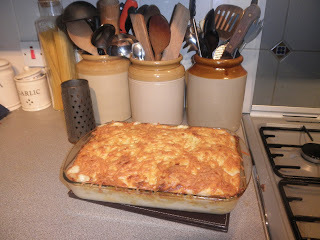 Cathy Crawford's version of Helena Lyttle's - Cheesy Potato Pie! Word's cant really explain how good this is, so try it! Have it as a side dish with chilli, roast meat, pasta or as a vegetarian main with lots of veggies. Everyone adores the crispy top! A note from Cathy Crawford: Thanks to my Auntie Helena Lyttle for my take on her legendary cheesy pie and lovely childhood memories. Boil potatoes until cooked but still firm (10-15 mins), drain potatoes and set out on board to cool slightly before slicing. Meanwhile prepare white sauce by melting butter, add flour and mix until it looks like buttery paste. Add the milk a little at a time (it is worth doing this slowly to ensure you get a lovely smooth sauce). Heat the sauce stirring continuously with a wooden spoon until sauce thickens. If feeling naughty, add some double cream to the white sauce before adding the cheese. Add grated nutmeg then half of the of grated cheese and stir in until melted.. set sauce aside. Put a layer of the sliced potatoes in the bottom of a lasagne dish or similar pie dish, sprinkle grated cheese over and then pour on some of the cheese sauce and repeat until potatoes all used. Keep enough of the sauce to pour over the top layer of potatoes (its best with lot's of sauce!) Cover the top of the pie with grated cheese. You can also add parmesan or your favourite hard cheese. Cook in a pre heated oven until sauce is bubbling and the top is gorgeously melted and crispy (30-40 mins).